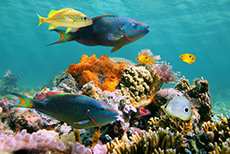 Roatan is a top-rated snorkeling destination in the Caribbean Sea. Loved this West Bay snorkel day. The water was beautiful, the guides were polite and efficient, and we had a great time. Booked a private catamaran trip with 15 people, for snorkeling and beach stop. Booked a private catamaran trip with 15 people, for snorkeling and beach stop. Was a refreshing and enjoyable time with small group, great food on board and fun crew. Two large groups were loaded onto a small boat to go to the snorkeling area. Like all other reviewers, this was a remarkable excursion. Went out on a boat from the Infinity Resort, went snorkeling for an hour. Went out on a boat from the Infinity Resort, went snorkeling for an hour. Loved it, it was so amazing. Highly recommend. 20 bucks for snorkeling, they had gear if you didn&apos;t.
The snorkeling is in the ocean, just a heads up. Went to Tabyana beach. This was by far the best snorkeling we&apos;ve done in the caribbean. Lots of fish, great coral, can walk out right from the beach, water was very clear and there was a lot to look at. Even though the leader of the group took off and left us behind, we eventually found the skyride and got to the beach. Loved it and the staff was very nice too. Tabyana Beach resort was great. Roatan has some of the best live reef in the world! Roatan has some of the best live reef in the world! Was a thrill to see a coral reef alive and thriving for once! Tabyana Beach was clean, snorkeling was excellent, food was ok.
Roatan Ocean Adventures.....Herbert was the best! Follow their advise and bring sunscreen! Jolly Roger crew was terrific. Jolly Roger crew was terrific. Different colors of vests depending on ability. They even took excellent photos free of charge and displayed then on their website for us to download. This was VERY appreciated. We pay 50 usd for 2 in one private taxi for few hours. Snorkeling at the 2nd largest barrier reef in the world. Did the Jolly Roger snorkel trip and highly recommend it. The excursion place took us there on a broken down bus which kept stalling out. The excursion place took us there on a broken down bus which kept stalling out. Then the beach was gross. The snorkeling part was fun and the reeef was beautiful.